Strong and dependable, toilet bowl brushes from Rubbermaid are constructed of synthetic polypropylene bristles that resist stains and odors. Made with an ergonomic and reinforced plastic handle, these Rubbermaid toilet brushes provide the easiest, fastest and most dependable toilet cleaning available. Measuring in at 14-1/2" overall length, these high-quality toilet bowl scrubbers are constructed with the cleaning professional in mind. 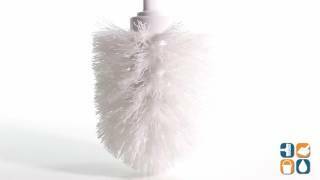 Able to withstand the rigorous nature of day-to-day bathroom cleaning, this high-quality toilet bowl scrubber is the ideal addition for professional cleaning services and home owners everywhere. Fits holder RCP 6311 WHI (sold separately). 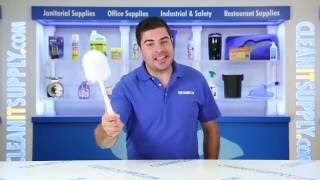 This toilet bowl scrubber is an excellent length and shape for reaching up into the rim of most toilets. Buy Now and Save! Dimensions: 14-1/2" long. Good sturdy product for scrubbing especially under the rim. Excellent for cleaning livestock watering equipment on our family farm.